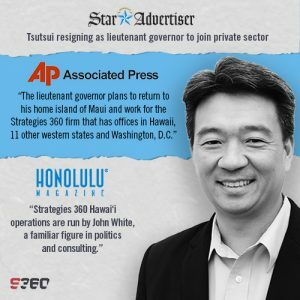 Honolulu, HI – Strategies 360 (S360) – the leading public affairs, research, communications and digital marketing firm in the West – is honored to officially welcome Shan Tsutsui as Senior Vice President to the firm’s office in Hawaii. With last Wednesday marking his last day in public office, Tsutsui officially begins the next chapter of his 15-year career of public service to Hawaii. Tsutsui was appointed to lieutenant governor by Gov. Neil Abercrombie in 2012 and won the seat outright in 2014. During his time as one of Hawaii’s top elected officials, Tsutsui earned a reputation as a respected consensus-builder, working effectively and cooperatively with leaders in the public and private sectors. He championed programs to help Hawaii’s youth, such as the Resources for Enrichment, Athletics and Health (REACH) Initiative which has invested nearly $3 million in Hawaii’s schools, and the Farm to School Initiative to help make school lunches healthier and locally sourced. Tsutsui also represented Maui in the Hawaii State Senate and served as Senate President. 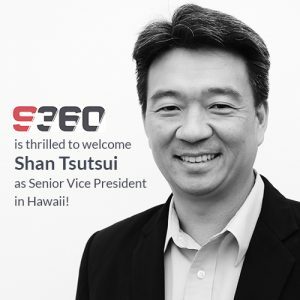 Tsutsui will be joining the S360 Hawaii team led by veteran public affairs and economic-development strategist John White. The firm opened its Hawaii operations in 2016 and has grown to include Public Affairs Director Khara Jabola, Government Relations Director Will Kane, and Campaigns and Initiatives Manager Molly Pierce. The announcement in Hawaii comes on the heels of several other major expansions across the S360 footprint: in the month of January alone, S360 announced a new office in Sacramento and dramatic expansions in its California operations, as well as the addition of 14 new employees firm-wide. S360 is the first public affairs firm in the West to offer a complete in-house digital, communications, and public opinion research practice. S360 combines its suite of unmatched service capabilities with a team of experts drawn from the worlds of government, politics, the news media, marketing and creative design to craft and execute strategies that help clients drive change throughout the West.